It was Sunday and we were planning to go out for ice cream. I recalled someone talking about Cocoberry, a frozen yoghurt chain. 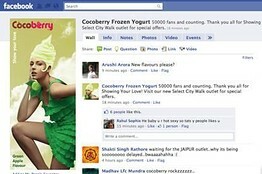 I searched for â€œcocoberryâ€ on Google and saw the link toÂ Cocoberryâ€™s page on Facebook. I visited the page and saw numerous comments by many of their satisfied customers. I could also see that they recently opened a store near my home. The decision was made. We had a great evening. Similarly, I was looking for details about the movie â€œDabangg.â€Â I was amazed to see theÂ results shown by GoogleÂ when I typed in â€œdabangg.â€ The first result provided me with a list of cinemas by location along with the timings for the next shows. The next result was a news story about Dabangg beating Aamir Khanâ€™s â€œ3 Idiotsâ€ in gross earnings on the opening day.Scrolling down, there were results with images and videos related to the movie. Finally, a live Twitter stream with real time (i.e. tweeted a few seconds ago) reviews and opinions. 1. We will seeÂ more social media channelsÂ (e.g. Facebook, LinkedIn, Twitter, blogs) among top results on search engines. In other words, what others say about you will be more important than what you will talk about yourself. 2. Search engines will continue to throw up theÂ latest and real time information. Again, the searcher will have access to better results. 3.Â Depending on the locationÂ (or if location-specific keywords are included in the search), results on search engines will vary. Thatâ€™s another logical shift to provide more relevant results to the searcher. For example, searching for â€œpizza in new yorkâ€ on Google, I get 569,433 businesses listed on Google Maps. 4. TheÂ results will include a mix of mediaÂ (i.e. images, videos) beyond pure text. This will further add to the quality of the results. 1.Â People will search for information beyond search engines:Â YouTube is already the second-largest search engine after Google. Similarly, Facebook is increasingly taking a share of searches online. 2.Â Search has already gone beyond your computer:Â Search on mobile devices (cell phone, iPad etc.) is gaining popularity and will continue to do so. For example, Twitter CEO Evan Williams wrote on the company blog recently that mobile usage of the site has gone up 62% in just over four months and 16% of all new Twitter users are starting out on mobile devices. 3.Â Search is instant now:Â With the launch ofÂ Instant Search by Google, the speed and the quality of search results will undergo a dramatic shift. And instant search is no longer limited to Google; a Stanford student, Feross Aboukhadijeh, has launchedÂ YouTube InstantÂ to search videos on YouTube instantaneously. It was interesting to see one of our videos start playing automatically the moment I entered â€œDigital Vidyaâ€ in the search box on YouTube Instant. What does it mean for businesses that want to be found by their customers when searched by relevant keywords on search engines? Will it create new opportunities for businesses to be discovered beyond search engines? What new techniques and tools should a business adopt to win in this new search paradigm? I will answer the above questions in my next article on social search. Feel free to share your thoughts, other relevant experiences and related questions in the Comments. It seems to me that Google has become the Super Search Engine. Do you think this will cause new search engines to fade away or will they be helped along? Based on Michale Porter’s five force factors, where do you see Google going? Will they prevail over all other search engines? Why?